Is my scooter faulty and is it a manufacturing warranty? Please bear in mind that no scooter is indestructible. You could spend £500 or £50 on a scooter and the same problems could arise. Always maintain and look after your scooter to increase its life span. Bolts, can round off easily so please pay attention to what tools you use. If a tool is old it may not be hexagon shaped any more so will round a bolt off. If you don't put the allen key in the hole correctly you will mash the side of the bolt causing the bolt to "round off". Rounded bolts are not a warrantably item - Rounded off bolts are classed as wear and tear. There are two kinds "dehubs". A real dehubbed wheel will have no marks in the metal or plastic rim. This is a manufacturing problem were the PU has not boned correctly to the rim of the wheel. The wheel PU will just push off the rim. 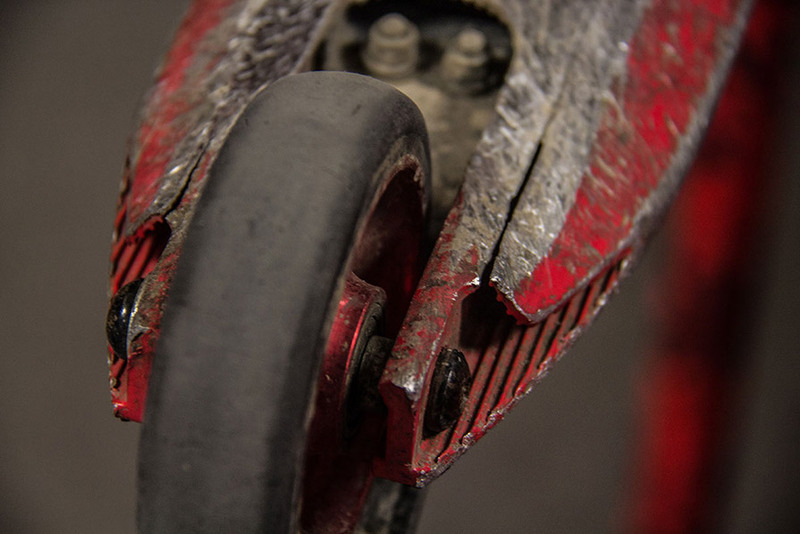 A dehubbed wheel can be caused when your scooter takes a hard sideways impact. Scooter tricks such as Bri's are the most common cause of this. If you chunk the wheel or debub it in this fashion then unfortunately its classed as wear and tear and will not be warranted by the manufacturer. Wheels are classed as wearing part and will need to be replaced after time like car tyres. My wheel is making a clicking noise from the wheel? If you are getting a clicking noise from the wheel it can be one of two things. The bearing needing to be cleaned and oiled if it's got any grit or water in it over time. To fit this use some 3in1 cycle oil or bearing oil to drip onto the bearing shield and then work into the bearing. Or you can remove the bearings and soak them in oil or replace them. Grit and water in the bearing is care and maintenance problem not a warranty issue for manufacturing defect but is generally easy to solve. 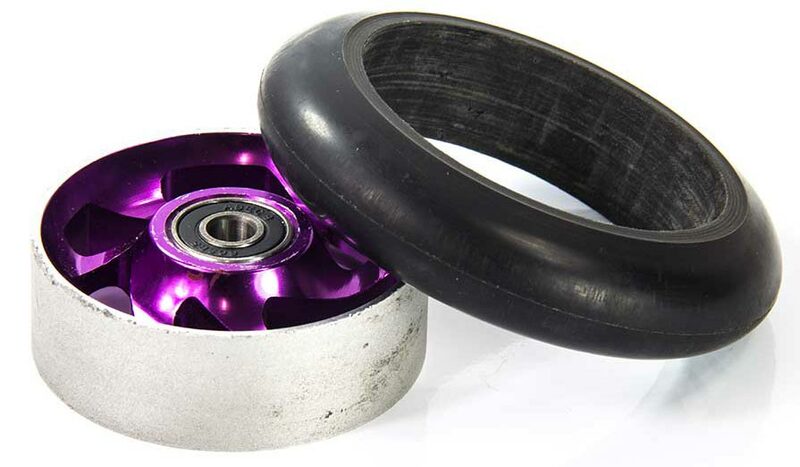 The wheel bearing holder in the wheel may have ovalised so the bearing doesn't fit tight into the wheel anymore also known as "death click" and is a loud clicking noise from the wheel. This is not a fault on the wheel but just from a heavy side impact bending the core. There is generally no problem continuing to use the wheel but it will have the click noise. The only way of fixing this permanently is to replace the wheel. This is not a manufacturing defect it is purely from hard trick use creating the ovalisation of the wheel. This is classed as a wear and tear not a manufacturing defect. My break snapped can I get another one for free? Brakes can snap especially if they are flex breaks and they are hit sideways. Flex fenders are classed as a wheel guard so please bear that in mind as they are classed as a weareable item. Spring brakes can go rattly over time. They are just held on with a spring which can loose their springiness over time. If you aren't a fan of this noise then look to attach a flex style brake! Make sure your grip tape is pressed all the way down around the scooter before you go on your first run. If you don't do this then the griptape can peel and fall off. Also using griptape in the wet will dramatically reduce the life span causing the grip to fall off or wear thin. To make your grip last longer avoid mud and water! Grip tape is a cheap wareable part. Handle bar grips do wear. If you want to make them last longer then carefully put your scooter down as throwing your scooter down can cause the ends to stove in. If the ends stove in then replace them ASAP as you may hurt yourself on the bar end. Bars ends are less than a fiver but will hurt less than having an exposed piece of metal hit you. You can end up snapping your bars in a variety of different ways. Throwing your scooter across the park or landing a trick incorrectly could bend or break your bars. Make sure you never throw your scooter in rage or for fun or let the scooter land on just one side. Badly fitted clamps or unsuitable clamps can damage or break your bars. Always make sure you have the correct parts for your scooter and that the clamp is sufficiently tightened up. If you ride with "play" in the bars this will dramatically enhance the chances of them breaking around the clamp area. Scooter decks that have been used for excessive grinding (especially on concrete/walls) will by their very nature wear down. This is not deemed a manufacturing defect. If you rub anything up and down concreter for long enough you'd make a hole in any material. A scooter deck is just the same. It doesn't matter if you send £20 or £300 on a deck they will wear down eventually. To help slow down the process of the deck wearing away - wax the deck and the wall to ensure a smoother grind with less resistance. This won't stop the scooter deck from wearing but it will slow the process down. We understand that trying to learn new tricks can be frustrating but throwing your scooter around the skate park is a sure fire way to damage it so please don’t! Most decks have crack in but don't worry they are most like paint cracks. Very rarely to they amount to anything serious. If you are unsure please get in contact. How will I know if my scooter is a warranty? After reading all the FAQ - if you're sure that you scooter is a genuine case then please feel free to contacted us. We have been selling scooters for 8 years and own a skate park so are at the forefront of scootering. There really isn't much we haven't seen which has given us a fantastic opportunity to witness countless broken scooters over the years, with this in mind we are able to make informed decisions based on information provided by the customer and help out where possible through good will.